That's gorgeous! Did she make it recently or was it one that was passed on to y'all? I love all the colors in it. How pretty! I'm curious about the same things osewme is. Do tell! Very pretty. I know you are glad to have it in the family. Great quilt and something to be treasured! Such a beautiful quilt and what a treasure to have that. I have the same questions as some of the others on this forum. Please share with us some history on this quilt. What a nice quilt. Can’t wait to hear more about it! 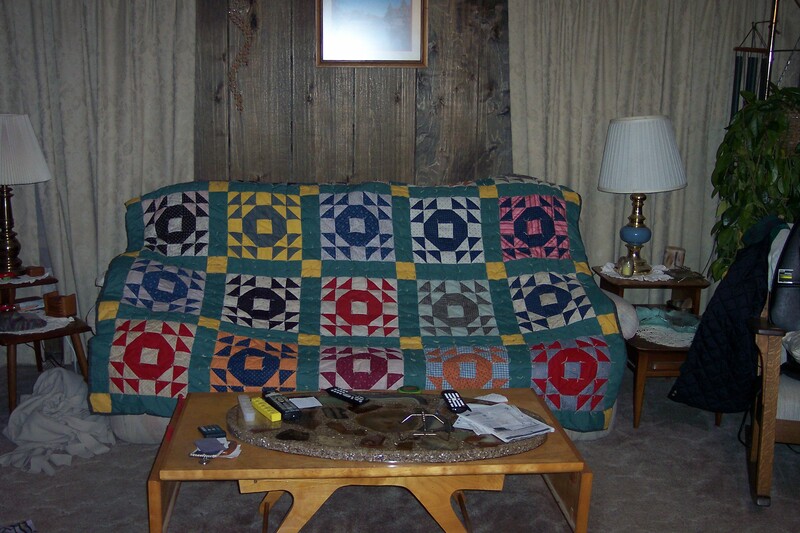 I love old quilts and that one is wonderful !!! Very nice treasure to have! it was made years ago don't know exactly when. From the colors, especially the green, I would guess sixties to seventies. Fabulous. I love older quilts from that time. It is a treasure for sure. Lucky you to have such a beautiful treasure. It's a treasure to be enjoyed. The older colors are so beautiful. She would be please to know you enjoy it. A treasure indeed. Cherish it. Take good care of it and use it! Quilts were made to be enjoyed. Thanks for sharing. That is a real treasure.